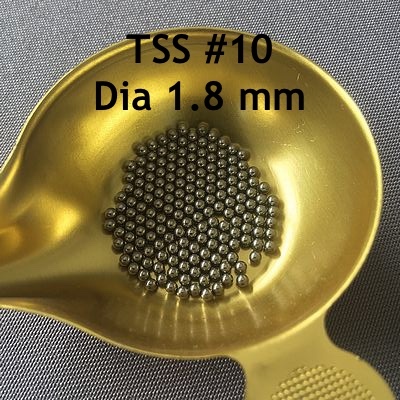 The TSS # 10, diameter 1.8 mm is the smallest ball in our shop. It is nevertheless not without interest because its small size gives it undeniable advantages. This is the lead equivalent of a 6 1/2 ball at the penetration level. NON-TOXIC and can therefore be used legally in wet areas. TSS # 10 (1.8 mm) logs can be used to shoot small and medium sized ducks (teals, vingeons) and shorebirds up to a minimum of 50 m. Indeed, the 30 mm penetration is reached up to 55 m and the average pattern density at this distance (in a 75 cm diameter target) remains of almost 8 pellets per dm² for a conventional 32 gram load. This shot is particularly suitable for small calibres with which it ensures a very important theoretical scope. Indeed, with the 24 grams of a 20 caliber, it ensures a pattern density of 6 pellets per dm² ball to 50 m which is enough for all our game or almost. Even with the 20 grams of a 28 gauge, the coverage is 5 pellets per dm² which ensures ultimate reach. Nevertheless, it is easy to load 12 gauge with 24 or 28 grams of shot and with speeds that can be greater than those of conventional loads, which, in addition to the comfort that the cartridge provides (little recoil) , gives a range increase that goes to 60 m.